All plants require food just like humans. In Nature plants live and die in the same place – nothing is removed and their constituents are recycled. Where crops are grown for human use, the products – grain, potatoes, fruit, vegetables etc. are harvested and removed from the field and the plant foods contained in these products are lost from the soil. In today’s society only a small fraction of this removal is returned in the form of organic sewage sludge. If this process of removal without replacement is continued for many years, soils would become impoverished and no longer be able to produce crops or support normal growth. 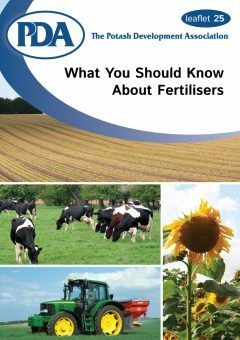 Farmers, growers and gardeners therefore need to apply a balanced diet of fertilisers and manures in order to replace plant foods removed and maintain the fertility of the soil and the vigour and health of the crops. All plants require a number of different elements to feed on, namely:- nitrogen (N), phosphorus (P), potassium (K), magnesium (Mg), sulphur (S), calcium (Ca), iron (Fe), zinc (Zn), manganese (Mn), copper (Cu), boron (B), molybdenum (Mo), chlorine (Cl), nickel (Ni). 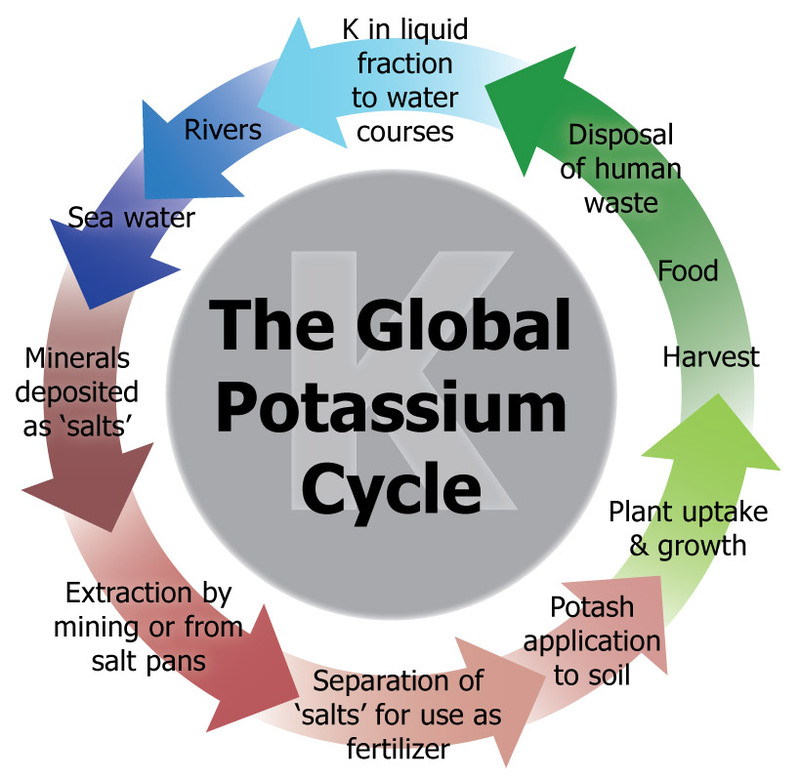 Potassium is the nutrient required by most plants in the largest quantities. This element occurs abundantly throughout Nature in soils, sea-water, plants, animals and man. It is the seventh commonest element on earth. For centuries farmers have recognised the benefits to plant growth of wood ash remaining after fires and this is because it is a rich source of potassium. The collection of this material in iron pots resulted in the common name of potash being adopted for materials containing this plant food. Nowadays potash is obtained mainly from very extensive rock salt deposits throughout the world which contain the crystallised minerals derived from the evaporation of sea-water. This process occurred naturally and on a very wide scale some 230m years ago – a few million years before the Dinosaurs. It still continues today in regions like the Dead Sea where the mineral rich water is evaporated by the sun to produce potash and common salt (sodium). The salts produced in this way are used for many purposes including soap manufacture and de-icing roads as well as fertiliser. The potash for plant food is prepared from the rock salt by washing away the sodium because plants do not require as much sodium as potassium. (no chemical process is involved). It can be used on its own as a “straight” fertiliser or combined with other important plant foods – principally nitrogen and phosphorus to produce compound fertilisers. All potash salts are naturally soluble in water and therefore freely available for plant uptake by the roots. Potash is a vital “regulator” in plant growth. It controls water content and the movement of other plant foods from roots to leaves and the formation of grains, fruits, flowers etc. Many aspects of quality are thus controlled by potash. Adequate supplies are essential to balance other plant foods and to create vigorous, healthy growth with natural resistance to pests, diseases and adverse climatic conditions such as cold, wet, drought etc. Soil acts as the natural reservoir for plant foods and although potash is soluble, very little is lost from soils because it is cleverly held by the clay particles and organic matter in the soil. A great deal of experimentation and research in this country has established the appropriate levels of plant food for different soils to ensure full healthy crop growth. Regular analysis of soil samples from each field are taken to monitor the level of plant food reserves. Measurements are also taken of the nutrient removed in the crop and replacement of the required quantities are carefully calculated and applied for each subsequent crop grown. There is no difference between organic production and conventional farming in respect of potash needs – the principles and correct approach are the same. Potash fertilisers are clearly not “artificial” or “manufactured” chemicals. They are natural materials. After consumption in the food chain, the potash content finishes up in liquid wastes and eventually returns to the seas from whence it came. Thus potash reserves are not being used-up or exhausted but simply re-cycled through a very long term system. The Potash Development Association is an independent organisation which provides technical information and advice to improve understanding of potash in soils and plant feeding. The PDA produces advisory leaflets, provides training via meetings and conferences, supports research and liaises with other organisations and Government to help co-ordinate fertiliser issues. In particular the PDA supports the activities of crop advisors and managers who are responsible for correct fertiliser practice on farms.